Michelle Russell is a multi-talented writer, performer, director and producer. Sunday, October 8th, 2:00 p.m. -- OAKLAND'S HISTORIC HOUSE. Ms. Russell will be part of a special event on the Darrow Family and Frank Gumm. Darrow was the person who obtained a scholarship for young Frank to attend Sewanee, thus changing his life.Michelle Russell is a multi-talented writer, performer, director and producer. Saturday, October 14, at the Ransom School House, answering questions about Murfreesboro History, and in particular her book, "From Tennessee to Oz. Times to be announced. Meanwhile, a new book is being released this August: "They Followed Their Dreams - The Story of Three Chicago Families" tells the story of three families who immigrated to America in the mid-1800s. More will be forthcoming shortly! FROM TENNESSEE TO OZ details the story of Judy Garland's family history in Tennessee. It is a fascinating historical drama that will interest both fans of history and Garland alike. For further information, please be sure to visit the additional pages on the links above! Norton Gum arrives in Knoxville, a pioneer town in the Southwest Territory, and marries young Sallie Clampit. Soon Norton, Sallie and their three small children will brave the wilderness of this newly formed state, Tennessee, to settle in Rutherford County. Ambitious to make something of his life, Norton Gum becomes a well-established part of the county until trouble causes him to disappear. Rutherford County grows and the town of Murfreesboro is established. More pioneering families arrive including the Crosthwaits, Marables, and Baughs, all of whom will play a large part in the drama about to unfold. Most citizens become wealthy through farming the land with the help of their African American slaves. The Baughs are no exception to this. At the height of its prosperty, Tennessee takes sides with the Confederacy and leaves the Union. The lives of the Baugh and Gum families are torn apart as the Union Army invades the area. With the men away at war, the women take charge of family life. There is great suffering, starvation and death. Mary Ann Marable Baugh returns to the land her father once owned with her grandson Rollie and her daughter Clemmie. They soon become aquainted with their new neighbors, The Gum family. Clemmie and Will Gum fall in love and get married. After Will T. Gum opens his store on East Main and Maney Avenue in Murfreesboro, liife is happy. But within a few years, Will's life becomes a downward spiral. Is Mary Ann Baugh telling the truth about him, or is he innocent and simply unlucky? Clemmie dies leaving Will alone with five children. Young Frank Gum -with his beautiful voice- is rescued by the richest man in town, Mr. Darrow, and sent to Sewanee, The University of the South. Frank's life takes many twists and turns, but it is not exactly as previously reported. Without knowing the full story, the true family story, the tale is not complete. The book concludes with Frances Gumm's young life. Soon, she will change her name and be known by the world as Judy Garland. It is a story that is funny, tragic and everything inbetween. This is the SAGA of Judy Garland's family history. In the end, Judy is reunited with her Tennessee roots. Part Two will be close to 400 pages with over 100 photos, family trees and follow-up on the people and their descendants. 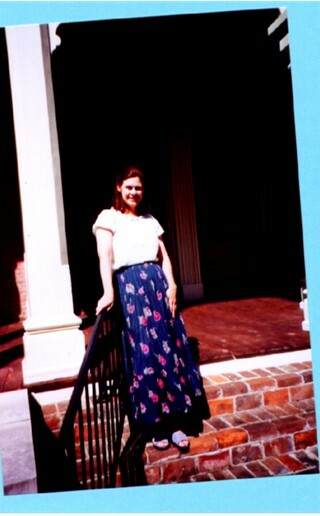 Author Michelle Russell on the steps of Oaklands Historic House in Murfreesboro, TN. This was the home of George and Tempe Darrow at the time Mr. Darrow obtained a scholarship to send young Frank Gumm to school at Sewanee. Visit the "From Tennessee to Oz" book site here! 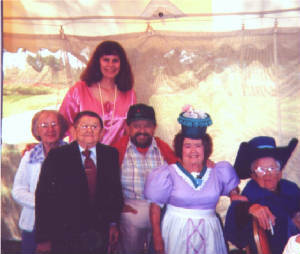 The Author with Munchkins from "The Wizard of Oz" film in Grand Rapids, Minnesota.